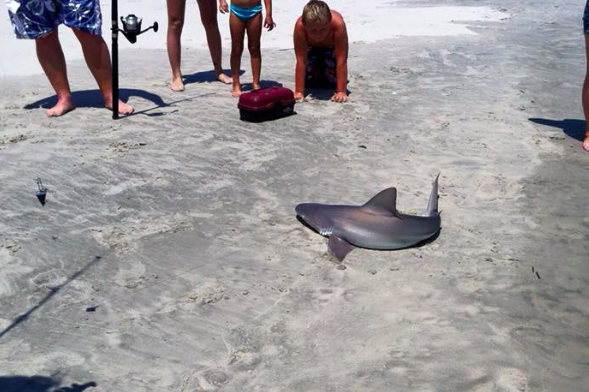 Baby shark pictured on Wildwood beach after young fisher reeled the animal in. 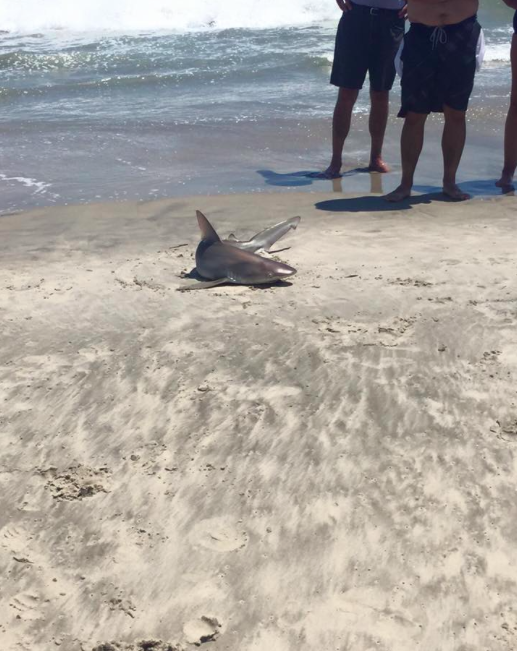 The shark craze of 2015 continues to build momentum after a Wildwood beachgoer fishing near 2nd Street hooked and reeled in a baby shark Saturday afternoon. Montgomery County resident Colleen Maye, visiting Wildwood for the weekend, was crossing the beach to return to her crew from a jet ski drop off when she noticed the commotion. "The kid who was fishing had to be about 17 or 18, and the string was pulling hard," Maye said. "I saw everyone else walking toward him, so I walked toward him. He reeled in that baby shark! I would say about 3-4 feet long." Last weekend, after a baby great white shark was spotted and caught off the New Jersey coastline, experts at the Marine Conservation Science Institute in Hawaii said that it may be evidence of a shark nursery forming in the New York Bight, which extends from the tip of Cape May to Long Island's Montauk Point. The encounter marks the latest in a series of sightings along the Jersey Shore and attacks along the coasts of the Carolinas. While certainly alarming, a recent long-term study conducted by researchers at Stanford University and The Lenfest Ocean Center determined that shark attacks have decreased significantly since the 1960s and that recent media exposure is likely contributing to heightened fears of a coastal shark invasion. Maye confirmed that the baby shark was later returned to the ocean at a distance from 2nd Street beach.